Add a splash of colour to your plate with the bold fusion of fresh ingredients on the menu at Las Iguanas restaurants. Combining the very best of top-quality British produce with a passion for Latin American cooking, their dishes are bursting with feisty flavours and plenty of fun. Pick up a Las Iguanas voucher and dine for less with Las Iguanas offers for even more mouth-watering savings! Sourcing their produce and inspirations from around the globe, Las Iguanas create their menu with plenty of what they consider to be the most important ingredient of all—passion! Looking to native Latin America, Spain, Portugal and even Africa for their fusion of creative dishes, their chefs are keen to share adventurous flavours with you, which are sure to become firm new favourites. The first Las Iguanas opened in Bristol in 1991 on a quiet side street and soon became a local sensation. The feel-good atmosphere and welcoming ambiance were the perfect accompaniment for the lively food—which blended traditional recipes with colourful Latin flair. Each day they create over 30 salsas and sauces by hand using authentic methods picked up during their time in South America, bringing you the closest they possibly can to Copacabana Beach in every mouthful. Why not give something new a try this weekend and pick up your free Las Iguanas voucher from our website? Not only will you experience an explosion of exciting new flavours, but when you dine with a Las Iguanas voucher code, then you’ll find they serve up a tasty saving on the side too! Before you set off for a tasty dinner with friends, stop by our website to pick up your free Las Iguanas voucher and remember to take it with you to the restaurant. On arrival, let your waiter know that you’ll be paying in part with a voucher code, so that they can note it down on your tab. Then settle yourself in for a lovely evening together. Choose from their extensive menu featuring all kinds of fresh and exciting new ingredients packed with handfuls of the signature Las Iguanas Latin flair. When you are ready to pay for your meal, simply present your Las Iguanas voucher code you’ve brought with you to your waiter, and they will be able to deduct the discount from your final bill before they bring it to your table. You may need to fill in your address and personal information for them. Check that the amount is correct and pay your bill. What a fabulous night out together at Las Iguanas—made all the more enjoyable with that additional saving too! Whatever flavours your taste buds are tingling to try this evening, when dining with a Las Iguanas discount code at any one of their restaurants across the country you will be sure to try a whole new selection of tasty dishes and tangy sauces which are inspired by traditional Latin home-cooking, all at great prices! 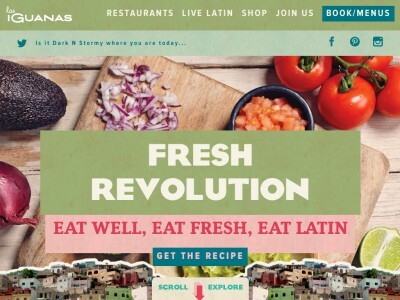 Explore their bright and bold menu choices for yourself by visiting Las Iguanas online today, and make sure to treat yourself to all kinds of tasty side dishes when you dine out using free a Las Iguanas discount code from our website! If you’d like to check out the menu options before you arrive at Las Iguanas you can take a look on their website, or you can even download a pdf version to print out beforehand. Give your local branch a call and book a table to make sure you have a reservation for the evening. When you arrive at the restaurant, one of the Las Iguanas friendly team will guide you to your table and present you with your menus. If you have special dietary requirements, or children dining with you, just ask your waiter about the options available and they will be happy to point you to the relevant part of the menu. Order your drinks and meals then dine in the warm and feisty atmosphere bursting with Latin American spirit. When are you finished and are ready to pay, alert your waiter and they will bring you your bill. Inform them that you have picked up a free Las Iguanas voucher and that you would like to redeem it. You can either present the voucher code as a print out or via your smartphone or tablet device. Your waiter will then take the Las Iguanas voucher code and apply it to your bill. The discount will be automatically applied and your total price updated. Simply let the menu do the rest of the talking by having a good look on their website for the full list of delicious ideas. From daringly spicy burritos to the full-on flavour of their chilli con carne, just remember to collect your free Las Iguanas voucher from us before you order any of their mouth-watering dishes! Be sure to keep them in your newsfeed, and share the latest updates with friends as soon as the new Las Iguanas offers become available! Buy now online at www.iguanas.co.uk. If you heard Las Iguanas and you imagined a trio of well dressed Lizards serenading you, you may be disappointed, but don’t let that stop you from booking a table with your Las Iguanas voucher or Las Iguanas offer and letting the tastes of Latin America wash over you. Consider every extra Las Iguanas voucher an invitation to add a side of gaucamole, and every additional Las Igauanas discount code an opportunity to indulge in another maragarita. If everything goes smoothly, you may even forget you ever imagined singing Lizards in the first place—Las Iguanas is just that good.